Led Zeppelin II Super Deluxe Edition! Includes previously unreleased audio, bonus LPs! • Two CDs, two 180-gram LPs and download formats included. 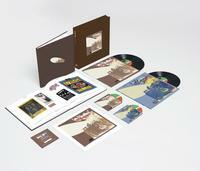 Led Zeppelin II includes previously unreleased studio outtakes and the unreleased track La La on LP & CD. Where is "bring it on home" the ninth titel on the original lp?